Navigate quickly, simply and easily over all obstacles with the DATRON XYZ sensor. With the help of this sensor, a measurement field in the Z plane is generated in a freely definable reference grid. This way, workpiece surfaces or reference surfaces can be measured and deviations in Z can be recorded and automatically corrected. The dispensing nozzle is guided according to the recorded offset using this technology, which guarantees the optimum dispensing height at all times. The measurement fields can be saved and loaded again later, as needed. Exact deep machining, even in the case of existing material tolerances or clamping tolerances. The XYZ sensor is a three-dimensional sensor which helps you reduce the set-up times of your machining system to a large extent. In this way, you can increase the referencing accuracy and reliability. With the XYZ sensor, you can make your production more cost-effective. Long and difficult set-up is now a thing of the past! A material edge or the material height can be measured with one measurement operation. With three measurements, you can determine the material height as well as the exact position of a right angled workpiece edge. Centres of circular or rectangular materials or depressions are defined automatically. 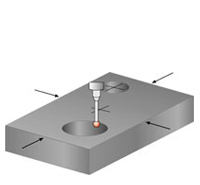 A material surface can be measured with point digitalization, and the CNC or engraving program can correct this measured height profile immediately. The 3D sensor consists of a measuring head with evaluation electronics, a swivelling mechanism with precision bearing, and an operating and evaluation software. 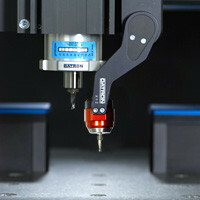 The sensor can be used extremely quickly for referencing or measuring in every machining phase. This is possible because the sensor is mounted on the Z axis, and the measurement is performed quickly when the sensor swivels from its home position to the measuring position. After the measurement is performed, offsetting occurs directly in the control without any loss of real time. 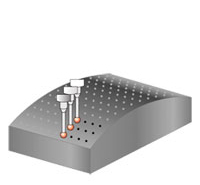 Sensor type TP-D is designed for medium precision measurements, for instance, to achieve a constant dispensing depth. The measurement accuracy is +/- 0.05 mm. The basic version of both sensors can be used for program-controlled Z measurement. 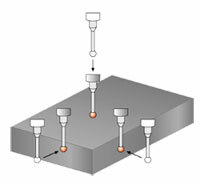 With the software extension "TP-3D", the CNC program can be extended by additional cycles for probing edges and determining centres. Compared to the TP-D sensor, the TP-R sensor has a lower probing force and offers a higher measurement accuracy of +/- 0.01 mm. The TP-R probe head increases the process safety as it is attached to the housing with a magnet coupling and is moved if the force is too high, protecting the sensor against damage.